Bloom Bigger, Earlier and in Greater Numbers! Begonias are prized for their ability to bloom nonstop from summer to frost. And now you can start your beautiful begonia display even earlier! 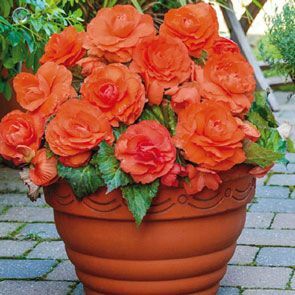 Our Superba Begonia Collection starts blooming weeks before other tuberous varieties and produces huge, 6" double blooms! Exciting shades of red, orange, yellow and white are set off by an elegant backdrop of green, serrated leaves—but sometimes the flowers are so thick, the foliage is almost hidden! 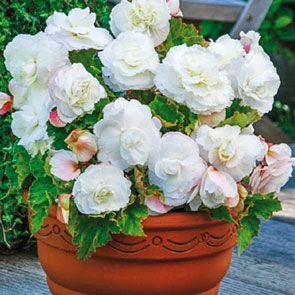 Unlike many summer bloomers, begonias thrive in problem shady areas, so they're perfect for planting under trees or in the shade of walls or fences. 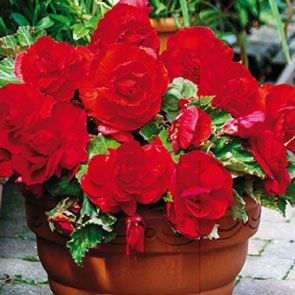 Another option is to plant your begonias in pots. 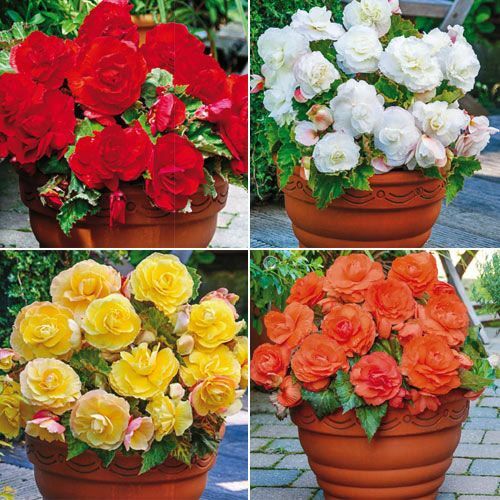 Their extended blooming period and compact height of 8-12" make them a great addition to the covered patio or porch. 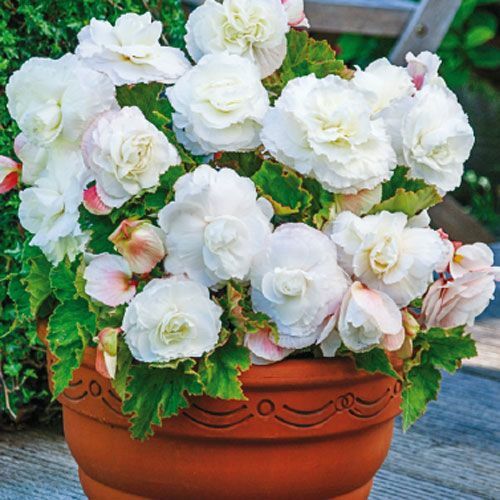 For some begonias, wind and rain can wreak havoc, but Superba blooms are sturdy enough to stand up to summer storms. However, even these "super begonias" are not immune to freezing temperatures, so if you live in zones 3-7, you will need to lift them in the fall. Plant your Superba Begonia Collection together or separately, and you will be amazed at the number of huge blooms that cover your compact plants all summer long! It's truly incredible! 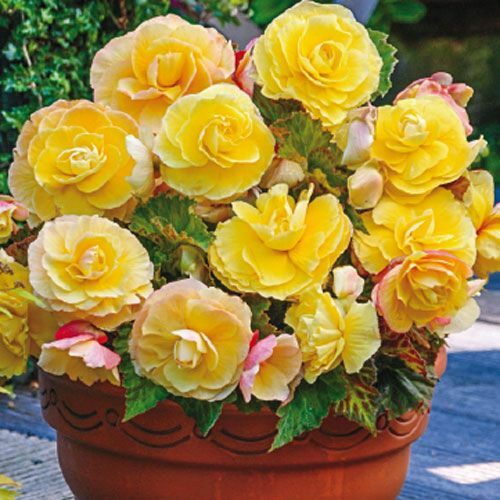 Watch with delight as your big begonia blooms arrive weeks earlier than your neighbour's begonias—and last from summer to frost! 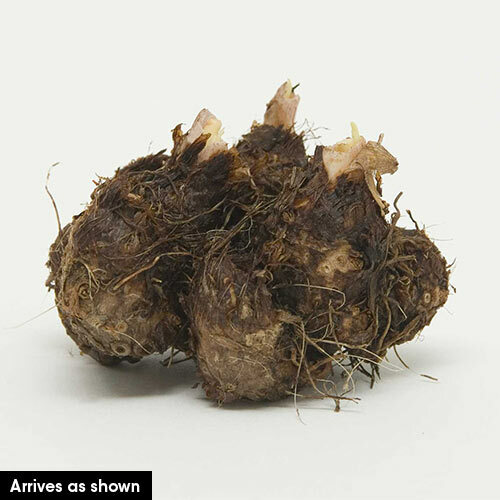 This Collection includes 3 each of the following varieties.